Exhibited: WW2 - War Pictures by British Artists, Morley College London, 28 October -23 November 2016, cat 102. WW2 - War Pictures by British Artists, Edited by Sacha Llewellyn & Paul Liss, July 2016, cat 111, page 154. Kenneth Rowntree had a natural flair for design, as is clearly demonstrated by many of his still extant early paintings, so it is not surprising that this talent was given early scope in his home town of Scarborough, where his father, owner of a department store, played a prominent role in local civic life. However, apart from the mention of a mural in a local children’s library details are scant and no records are known to exist. His first documented mural commission, dating from 1942, was for the British Restaurant located in the disused church of All Saints, Acton. The effect is heraldic: fully modeled realism would have been less effective. Rowntree’s sense of rhythm and pattern came to the fore......As a muralist Rowntree understood art for public spaces - it called for a maximum legibility from a distance, simplification and an instantly recognisable catalogue of images, John Milner, Kenneth Rowntree, Lund Humphries). 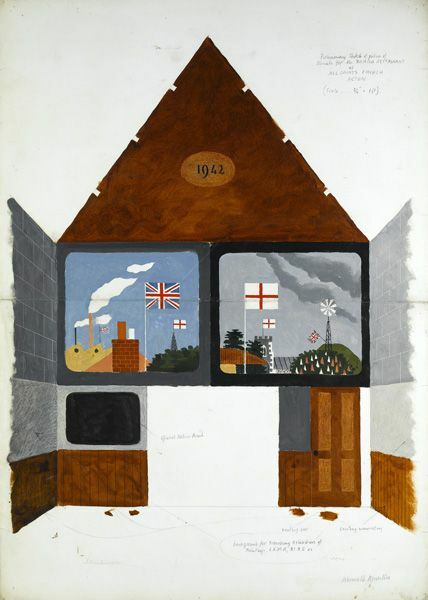 Peyton Skipwith, Kenneth Rowntree, A Centenary, 2015.